This last week, I had two friends visiting from New York, and we decided that it was time to do some reckless eating, recession or no recession. We had a lovely stop in Dromoland and a meal of the usual high standard at the Charthouse in Dingle. 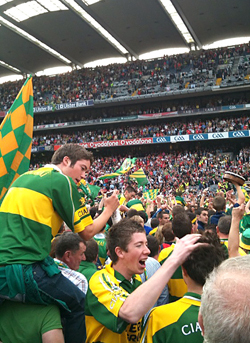 Then we headed to Dublin for a return visit to Chapter One and Thornton’s in Dublin. In Ireland, although we’re proud of our scenery, our castles and our pubs, we still tend to be apologetic about food. Do we think Ireland remains backwards when it comes to good eating? I don’t. Last year’s culinary tour of France proved to me that we have restaurants that can stand proudly with any in the world, and we were about to visit two of the best. For any of you who haven’t been to Chapter One to taste Ross Lewis’ cooking, get yourselves down there! Four years ago, I thought it was really great. Two years ago, I thought it was even better. Last summer I went, and found that he had hit still new heights. One of my two visiting friends had gone with me for that summer meal, and I think the experience was half the reason she came back to Ireland so soon. This time, it was yet again sublime. The other friend travels the world in a very high-powered job, and fine dining would be a very regular occurrence. Not only did he say that he didn’t think there was a restaurant in New York as good, but he said it was his best meal in years. Period. The next night, I brought them over to experience Kevin Thornton’s culinary wizardry. Sadly, after nearly a week of stuffing ourselves, we couldn’t muster the courage for the full tasting menu. This was a shame because one of my friends is a strict vegetarian. In many restaurants, vegetarians feel like second class citizens, a bother to the chef. At Thornton’s, not only do they accommodate you, but they whip out a full vegetarian menu – just as exciting as the regular menu, including the option of an 8 course “surprise” menu of dishes at Kevin’s whim. I thought the options looked so good that I traded in the regular menu and wasn’t one bit disappointed. Next time, we’ll spare ourselves some of the meals and come back for the full treatment. It surely must be as close to vegetarian heaven as it gets. 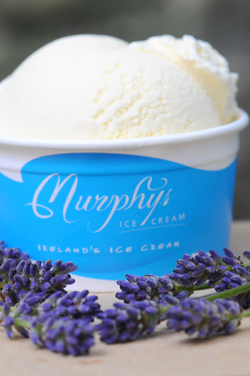 I’m about to head off to Dublin with a freezer full of ice cream, and I do hope if you come to Bloom in the Park you’ll come by and say “hi.” You can taste the two flavours I’ve made specially for the event – Elderflower Champagne Sorbet and White Chocolate and Lavender! I’m not a huge fan of zoos, since I usually find them depressing, but I must say we had a very enjoyable outing to Dublin Zoo a few days ago, and I would rate it highly. It was during the Queen’s visit, so we pretty much had the place to ourselves, except for a couple of families and one group of school girls. My brother was there with his kids in the summer when it was busier, and he still enjoyed it, so perhaps crowds wouldn’t make much difference. For us, the weather was sunny, the strolling was pleasant, and Róisín had a great time. So, if you have some time in Dublin and a love of animals, it’s worth a visit. Camphill is a worldwide network of communities for people with special needs, and it’s an organisation that’s dear to my heart, since I have seen on many occasions the good work they do. Since Ireland has a very strong group of communities, we’ve always wanted to find a way to help them in some way (not just the odd fundraiser we have done in Dingle). 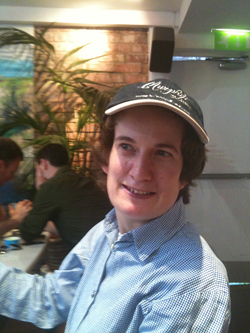 I spoke recently with Camphill Greenacres in Dublin, and they said they would love it if we could employ one of their special needs people a couple of mornings a week. Done! Above is Mary, and she is a very special person indeed. She’s personable and warm, and I’m delighted to say she’ll be with us in our Wicklow Street shop on Tuesdays and Friday mornings. What was especially warming to my heart was that she arrived this Tuesday with a carrot cake she had baked herself in the Camphill kitchens (we’ll give them a donation for each cake). 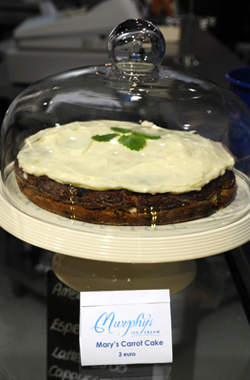 So, hopefully we’ll not only have Mary, but we’ll have Mary’s cake as well! I hope if you come in that you’ll make her feel welcome, and also that you’ll try a piece of her cake. She’s very, very proud of it. 1. Queen of Tarts. 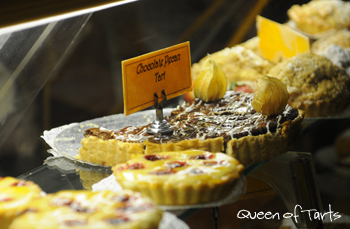 I have heard so much about Queen of Tarts, and it was the first time I made it there. What a great, relaxed place for a sweet treat and a bit of tea on a drizzly afternoon. 2. Trinity Capitol Hotel. We stayed in this seriously funky hotel, and we enjoyed every minute. At a rate of €67, it seemed an utter bargain, with stellar service and comfortable rooms. The only downside is that the hotel is wrapped around a fire station. We didn’t hear any outside noise and slept quite well, but apparently one should ask for “courtyard view” to avoid any sirens. 3. 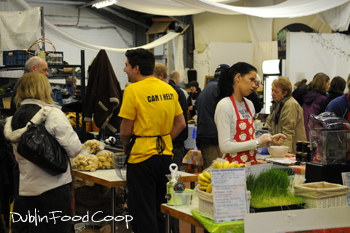 Dublin Food Coop. If you’re looking for organic produce, interesting producers, or simply a nice, wholesome change of pace, it’s worth checking out this organic food market on Saturdays. It’s in an industrial estate in the Liberties, but it’s worth seeking it out! While there, pick up some of the excellent, award-winning organic milk and other products from Moon Shine Dairy. I apologise about lack of photos, but somehow I managed to head to Dublin without a charged battery for my camera. 1. Third Floor Espresso – 54 Middle Abbey Street. First and most important – THEY ARE ON THE GROUND FLOOR, NOT ON THE THIRD FLOOR! Barista Colin Harmon is far more obsessive than we will ever be – in a good way. He really, really cares about coffee, and we give him top marks for care, attention, and delivery of great smooth coffees without the burnt and bitter taste unfortunately found at so many Irish cafes. There are no over-sized latte mugs here, just good coffee in traditional Italian sizes, and his prices are astonishing – €2 for a cappuccino, €1 for an espresso. Check him out! 2. The Wild Goose Grill – Ranelagh. Although its reviews have been mixed (see here), we had a very good meal at a very reasonable price (24.95 – special for three courses). Keep it in mind if you’re hungry in D6!